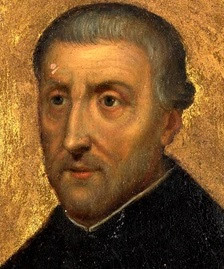 Peter Canisius, (1521 – 1597), was a Priest and Doctor of the Church. He was educated in Cologne, studying art, civil law and theology, being awarded a master's degree at age 19. He was ordained in 1546 and travelled and worked with Ignatius of Loyola, his spiritual director. He led the Counter-Reformation in Germany, Austria, Bohemia, and Switzerland, and his work led to the return of Catholicism to Germany. His catechism went through 200 editions during his life, and was translated into 12 languages. He became a noted preacher and often worked with children. He taught, preached, edited books, and worked to support the Catholic press and printers.